This Homemade Apple Pie Moonshine is your dessert and after dinner cocktail all in one! Ready in about an hour, it also makes a great Christmas gift! Click here to pin this Easy Homemade Apple Pie Moonshine now! 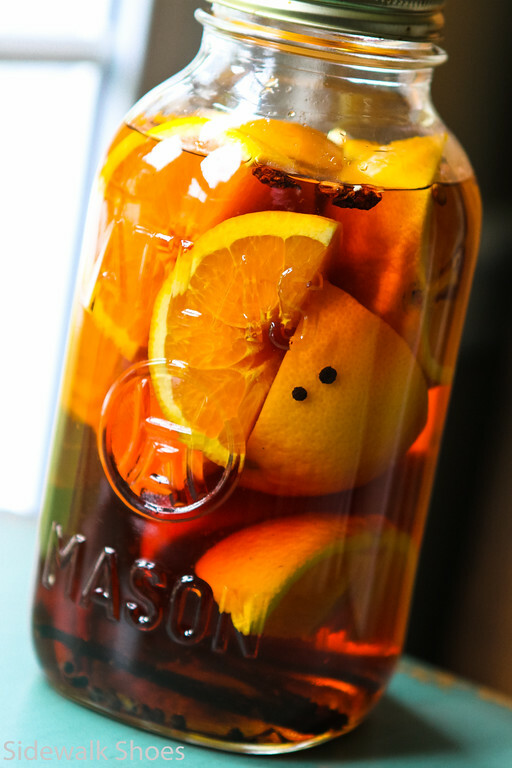 Homemade Liqueurs are so Easy! Everyone knows I love making my own liqueurs. Some of your favorites have been my Diy Ginger Liqueur, Vanilla Infused Rum, and Chamomile Pear Infused Vodka. I love something where time does all the work. I’ve done lots of summer and winter type liqueurs, but hadn’t dabbled that much in fall liqueurs or in this case fall moonshine. 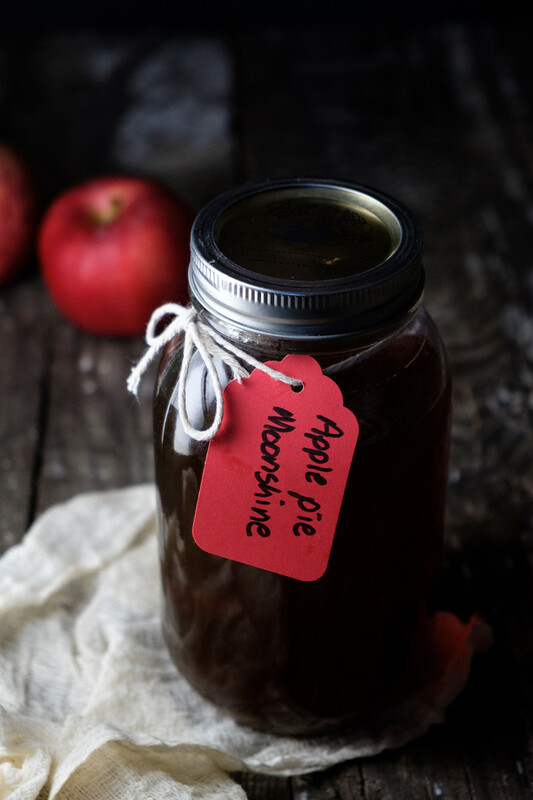 But once you make this Homemade Apple Pie Moonshine, you will return to it every fall! 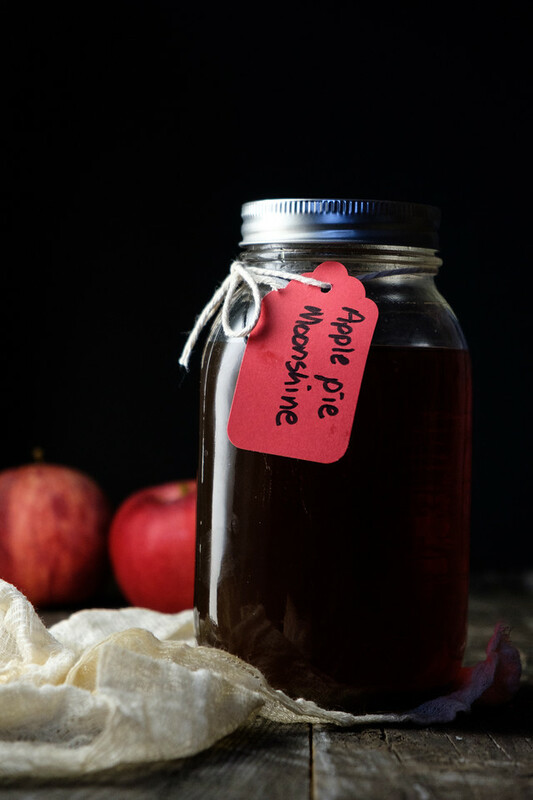 Make Your Own Apple Pie Moonshine! I have to give credit to Mr. Sidewalk Shoes for this one. It was completely his idea to make some apple pie moonshine from some Tennessee Moonshine. 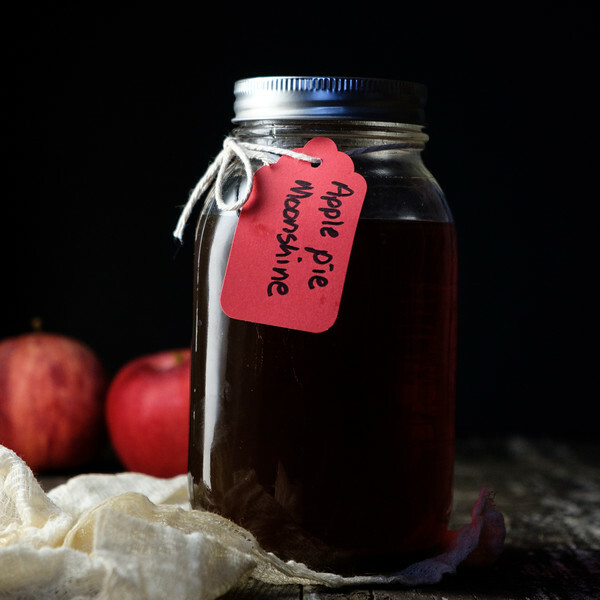 Now, you can buy apple pie moonshine, but it’s fun and easy to make your own! So, I googled Apple Pie Moonshine. Turns out there are as many ways to make as there are to drink it. I finally settled on my version, which would include apple cider, apple juice, brown and white sugar, cinnamon sticks and Tennessee Moonshine. All you do is combine apple cider, juice, sugars and cinnamon in a large sauce pan. Bring to a boil, then turn off the heat and let it cool to room temperature. Stir in the moonshine. Pour into mason jars. I think putting in these cute mason jar mugs would be great for gifts! You will not believe how quick and easy it is to make this! Warning – this tastes so good, you do not realize how strong it is. We love to stir it into hot apple cider, into tea, poured over ice cream and just sipped. It makes a great Christmas gift. 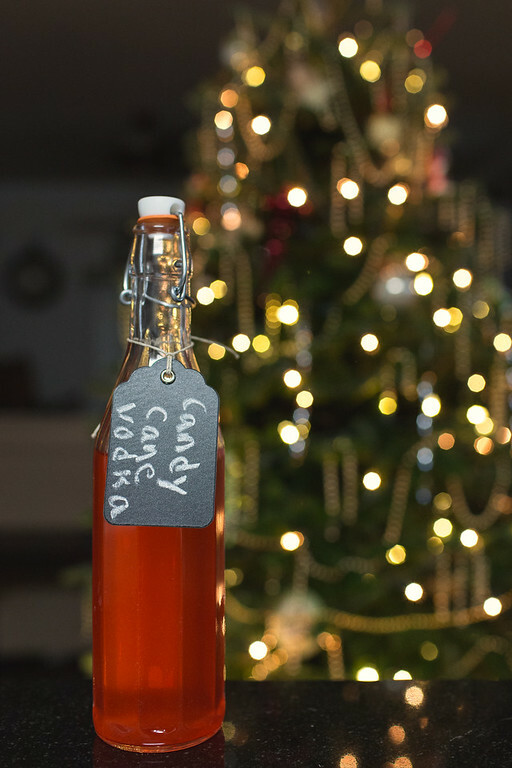 This Homemade Candy Cane Vodka is also ready in about an hour and is soooo good!! Plus it makes pretty cocktails! One of the most popular recipes on my blog is this Winter Solstice Brew! It takes about 5 weeks, so get started now! Why buy storebought when you can make your own Homemade Apple Pie Moonshine. It's ready to drink now, but it gets even better with age! Do you have access to Everclear? Seriously, I have this country of yours. Your husband deserves a pat on the back for this one for sure! It’s perfect for gifts and you know, as soon as I saw Apple Pie and Bourbon I thought of the TV show Justified. If you’ve ever seen it you’ll know what I mean. I never watched Justified though my stepson kept telling me I should! Alexis just loves that stuff. She mixes it with Dr Pepper which sounds REALLY bad but it is so good. Everyone that she gets to try it loves it. Great gift idea. I know several friends who would enjoy this. My next door neighbors were just talking about this. I must be living under a rock since I had never heard of it. Well thank you Mr. Sidewalk Shoes! Sounds dangerously good! Do you think you could make it with vodka so it wouldn’t be quite so strong? I love the way you “bottled” it, so adorable and so innocent looking! Makes me wanna sing “Rocky Top”. I think the husband would love this! We can buy “moonshine” right here in our Costco in Washington state, but this looks more fun…..
Let me get this straight: You want all of your gift recipients to snooze through Christmas? Well, that sounds good to me! The apples are in full swing around here, too! A great idea, Pam. And a timely one. I have cider in the fridge…just need the moonshine. I will surely need it when I return from the meeting today about the kitchen clock. The last one was huge, the Clock That Ate New Jersey. Shaking in my tennis shoes. GET OUT!!! This is awesome, Pam! I have been playing with my new still, making herbal waters and liqueurs. It’s really fun to do. I’d love to play with this. Drinking my apple pie is a fun idea. This would be dangerous in my hands…I’d probably drink it with every meal! ps, is this what you call baking? as in you are toast?! Well thank you Mr. Sidewalk Shoes! This is a great idea Pam. I’d love to have this on hand for Thanksgiving company. And as Marjie says, “easy peasy” too!